This movie despite being in The Conjuring universe (one of the scariest movies I have ever seen), was not one that I looked forward to. I used to like watching horror movies but since my wife's rather traumatic experience of watching The Ring (the original Japanese movie, not the Hollywood remake version), she was not that into seeing supernatural horror movies anymore. For me seeing a horror movie in the cinema by myself was not a real favorite activity. The last time I did that before was in previous year when I saw Lights Out. But yesterday it so happened that I got lucky when trying to get a free movie voucher that I had to claim on the same day. So off I went to the cinema and used the voucher immediately to see this one. Better use it to watch something new, right? My wife preferred to do her blogging work (a decision that I am glad she did due to the nature of my experience later on). Well let us move on to the movie. A Catholic orphanage led by sister Charlotte (Stephanie Sigman - Once Upon a Time in Venice) had to be closed due to some financial problems. It was a good thing that the orphanage was given a lifeline to stay in a very large house owned by Samuel Mullins (Anthony LaPaglia - Without A Trace TV series, Autumn in New York etc) and his wife Esther (Miranda Otto - The Lord of the Rings 2 & 3, What Lies Beneath etc). When Charlotte and the girls first arrived at the house, they were all very excited and felt very happy to experience staying in such a big place. There were 6 girls altogether with 2 teenage girls named Carol (Grace Fulton - Revenge TV series) and Nancy (Philippa Coulthard - Secrets and Lies TV series), plus two almost teens named Tierney (Lou Lou Safran) and Kate (Taylor Buck). The other two were the youngest of them all but very close to each other. Janice (Talitha Bateman - The 5th Wave) was the bigger one while the youngest was Linda (Lulu Wilson - Ouija: Origin of Evil). It was very clear though that there were a lot of mysterious and dark things around the house. The first to experience it was Janice who started to find our "favorite" doll that we know so much, which was told in the beginning of the movie that it was created by Mr. Mullins who was a very good doll maker. Later on, not only Janice having the scary experience but one by one they would also experience them which would forever change all their lives. So what was the story behind the doll? How did it become so scary? And how did the Mullins fit into this? 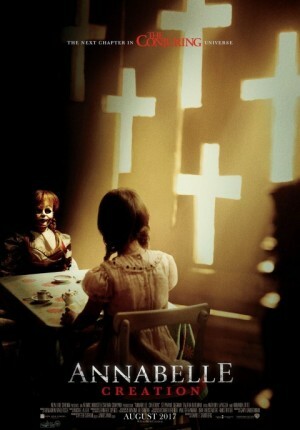 Find them all in this scary movie. Yes, this was another one of those really scary movies. I counted there were at least 3 very scary moments during the whole movie which ran for about 109 minutes (not too short like slasher horror movie). The rest of them were not scary but just having shocking effect. Now my experience watching this one was probably a little bit disrupted by the behavior of some of the audiences. I was a bit disappointed that the 4 guys on my left side were very noisy and make regular comments through out the movie. While some ladies on the left side and behind me were making fun of the movie (like trying to scare some of their friends or making useless remarks). I get that some people were very scared watching this kind of movie, and try to make jokes to reduce the fear but if by doing so you make fun and making comments or noises up to the level of disturbing other people, then I believe you should just watch the movie at home. Apart from the disturbance from other audiences, actually I pretty enjoyed watching this movie with lots of people surrounding me. It did reduce the fear factor of watching movie without anyone to accompany me. The movie was having all the usual effects of dark places in a large old house, with the occasional surprises every now and then. The sound effects were put to good use, especially the music during those scary moments in the climax, or even the silence in certain scenes. This time David F. Sandberg (director of another good horror movie Lights Out) was able to create the creepiness of an old house, with the scary Annabelle doll and combine them with the mystery surrounding the Mullins family. It was also very very cool of him to make references to the Conjuring 2 movie, plus of course the ending scene which you could only understand if you have watched Annabelle. I think David did a fantastic job of making sure this movie was up to the standard the other movies in the Conjuring universe have set previously. I also like the performance of the young Talitha Bateman as Janice and Lulu Wilson as Linda. Both of them did wonderful job of portraying their characters. There were also few funny moments usually involving Linda as she was the youngest and therefore was very playful. I think the stars of this movie were actually the two of them while the rest of the cast did not give too much impression to my opinion. As a supernatural horror movie, this one was worthwhile to see in the cinema to give more scary impact and of course to enjoy the dark surrounding and the good sound effects. If you are a fan of horror movies and especially if you want to see some continuity with The Conjuring series, then this is definitely a must see movie. But if you are one of those people who do not like supernatural horror movies, then it would be best if you avoid this one. By the way, the movie had 2 post credit scenes. So you can wait and see them by waiting till the very end. The last one was better to be seen not by yourself.